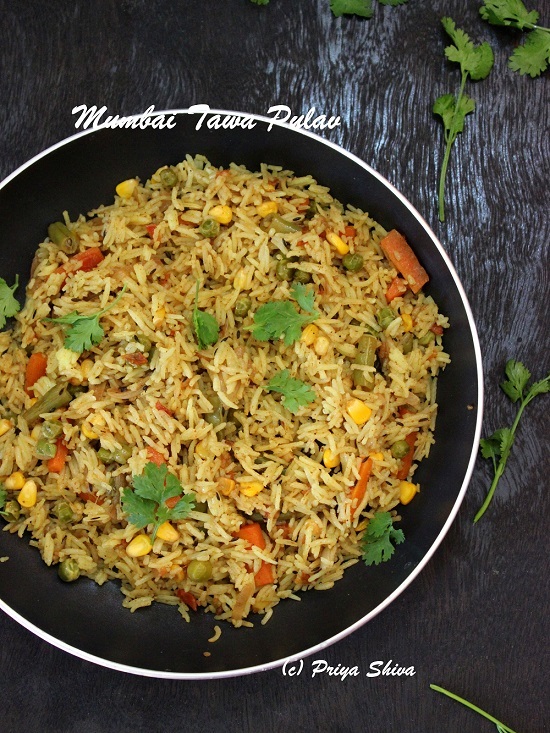 Tawa pulav – a delicious, aromatic street food from Mumbai India where basmati rice is cooked with blend of spices and vegetables. The name itself is enough and I start drooling! I tasted this dish for the first time in my Uncle’s house. I was in college at that time and went to Mumbai to enjoy my summer holidays with my cousins. It was spicy, tangy and the flavours linger on for a long time. It is a very famous street food in Mumbai and totally irresistible. I finally convinced my aunt to teach me how to cook this dish. So, sharing the recipe with you all and hope you all cook this quick dish and enjoy! Cook a delicious one-pot meal with flavours and aroma of various spices! Rinse the rice grains nicely few times in water. Soak the rice in enough water for 20 minutes. Drain the water completely and then add the rice to a pan along with 4 cups of water, little salt and few drops of oil. Stir gently and cook the rice on medium flame till the rice grains are cooked well. You should be able to mash the rice grain between your fingers but make sure it is not mushy. Drain the excess water and spread the rice in a plate and cover it. Cook carrot, potato, beans, corn and green peas in a pan or pressure cooker till they are soft and cooked. Add ghee in a frying pan and add the cumin and fry them till they crackle. Add sliced onions, bay leaf and saute till onions are translucent. Add the finely chopped tomatoes and capsicum/bell pepper and saute for few minutes till tomatoes are soft and mushy. Add turmeric, red chili powder, pav bhaji masala and little salt and stir well. Keep stirring till you see oil leaving on sides on the pan. Add cooked potato, carrot, beans, corn and peas and mix well. Now add the cooked basmati rice and gently mix the veggies with the rice. Remove from the flame, add lemon juice and mix gently. Garnish coriander leaves and serve tava pulao hot with raita. Vegans can use vegetable oil (olive oil or sunflower oil) in place of ghee. [br][br]I have added sweet corn but you can totally skip adding it. Priya, I am reading the recipe and drooling! 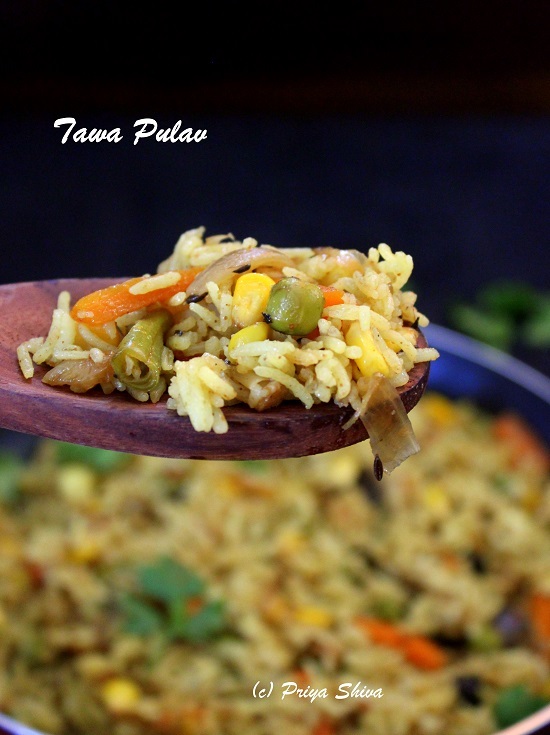 I absolutely loved the blend of vegetables and cumin with the rice! 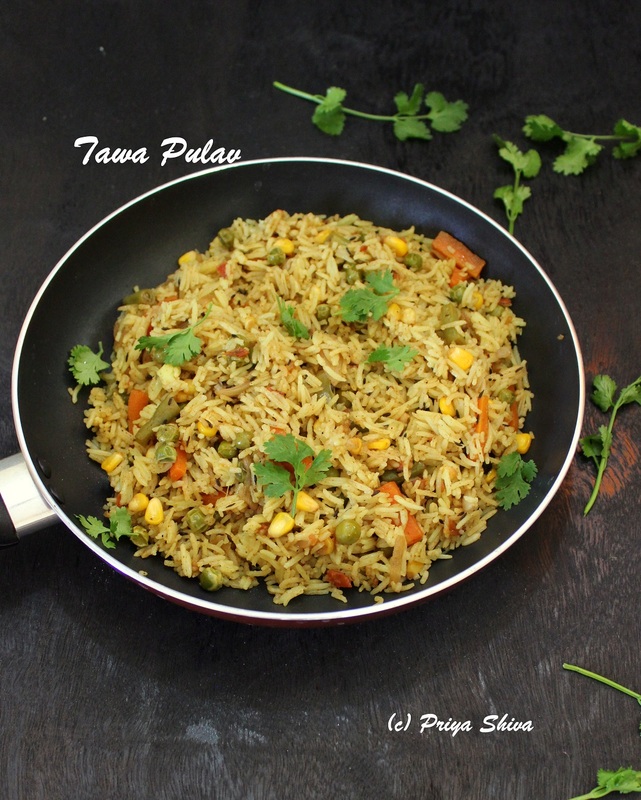 I am pretty sure that the Tawa Pulav / Mumbai Tawa Pulao is a taste to remember! Pinning to try it later! Heavenly delicious!